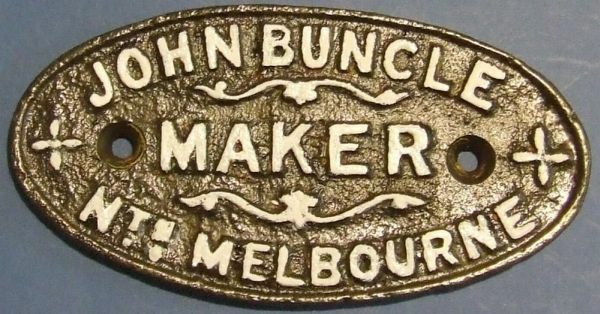 John Buncle Maker Nth Melbourne - Cast Iron Plaque 6in long. 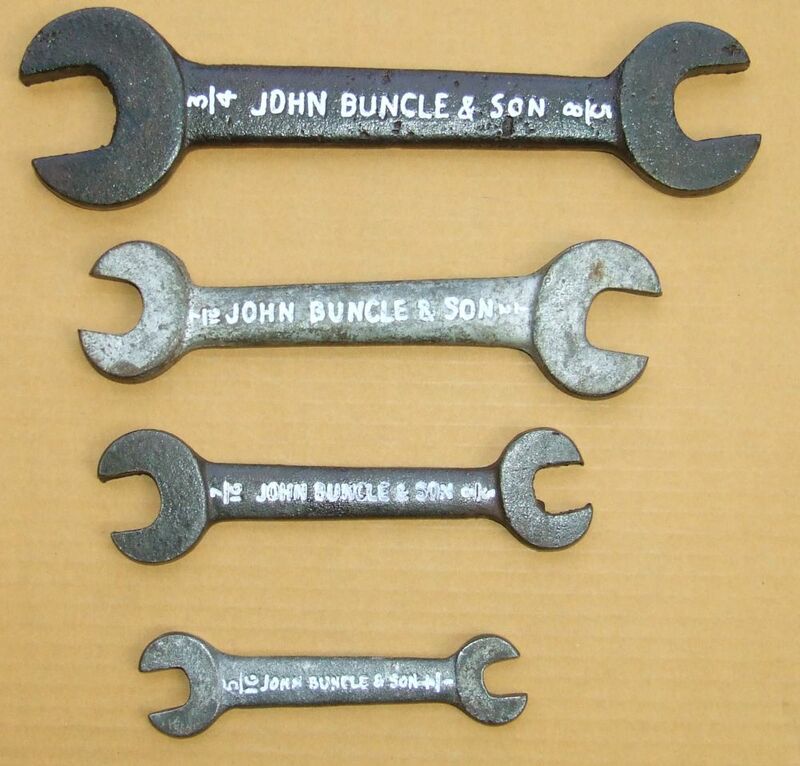 John Buncle early malleable double open ended spanner - 23in long. John Buncle was born in Edinburgh on 12 October 1822. He died in Melbourne on 26 December 1889. He served apprenticeships in engineering and pianoforte-making; worked for several firms designing steam engines and locomotives; was chief draftsman and designer at London and Northwestern Railway workshops, Crewe, Cheshire for six years; Vulcan foundry ca 1845-52; arrived Melbourne 1852. Worked at Langlands foundry 1853; then his own business from 1853, doing a variety of tradesmen's jobs, later settling to engineering and contracting interests and gradually turning to the design and construction of agricultural implements and machinery with which his name is chiefly associated; took an active part in founding the Hotham School of Design and taught mechanical drawing in its early years. He served as president, Melbourne Chamber of Manufactures. He served two terms as mayor of Hotham (North Melbourne). 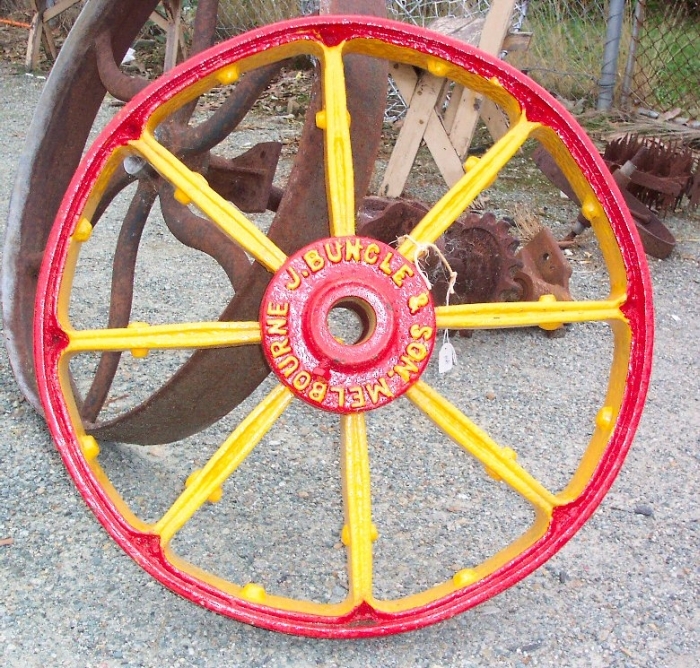 John Buncle established an engineering firm in Melbourne in 1853, supplying the ironwork for several large bridges for Melbourne and other parts of Victoria. The agricultural implements and machinery he invented were significant in the evolution of 'extensive' farming techniques in the nineteenth century. 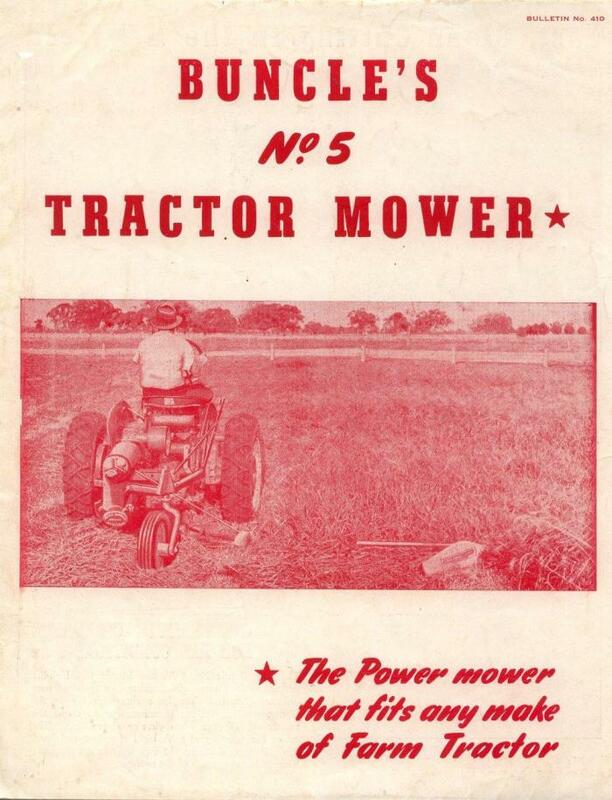 Buncle registered many patents for improvements to chaff cutters and other agricultural equipment. 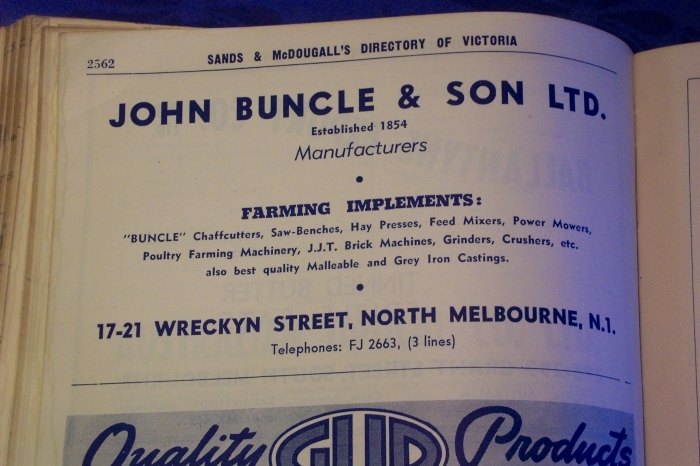 The business was variously known as John Buncle & Son or Buncle Engineering, and situated in North Melbourne, Victoria, Australia. Spanners supplied by Buncle were presumably for his agricultural equipment, made of cast and malleable iron in Whitworth sizes. Examples of Buncle end spanners in cast iron in about 4 sizes are not rare in Melbourne even now. Above - Cast Iron spanners marked JOHN BUNCLE & SON / MELBOURNE there may be more to the set ©Ozwrenches. Buncle “S” shaped malleable end spanners are much harder to find. The large malleable iron straight end spanner shown below is uncommon. This Malleable Buncle, about 185 size is also marked N3: on the back, other companies have used the N3 spanner - it appears that some company supplied them on order © D Symons. 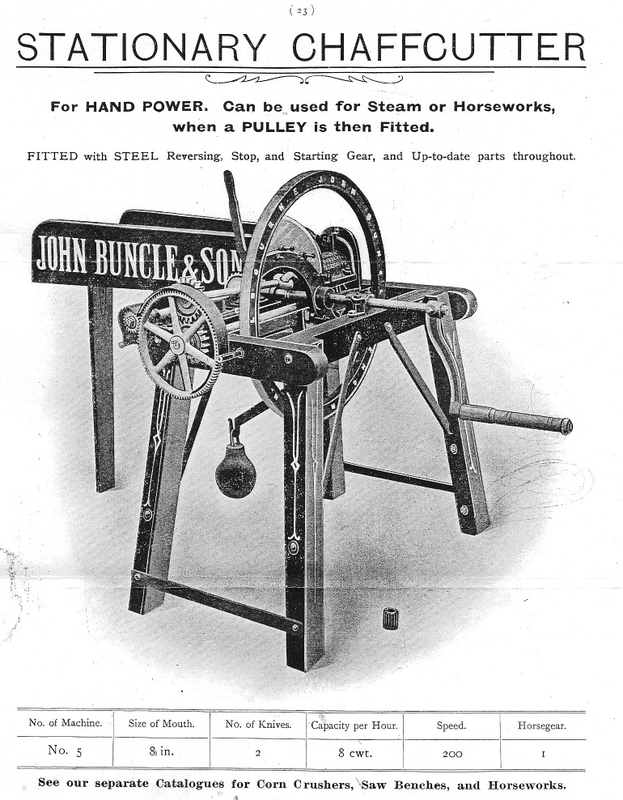 I have not been able to find any Buncle Catalogues personally, but advertising material for Buncle chaff cutters in particular, can be found in hardware catalogues, agricultural journals and directories and I know of a 1913 Catalogue of Chaff Cutters, an excerpt of which appears below. 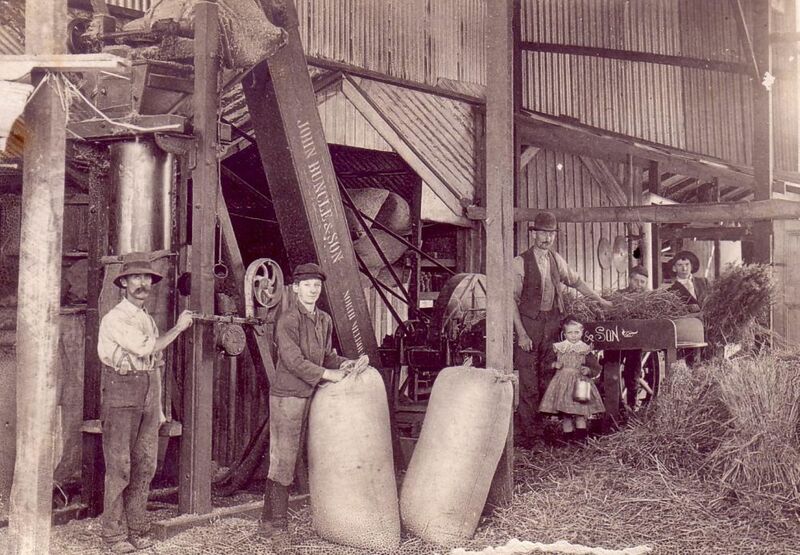 Cutting Chaff at Preston on a Buncle Chaffcutter c 1910. Charles Florence Wilkinson established a timber, hardware and fuel business at 232 High Street, Preston (Victoria, Australia), in 1906. At the rear of the property he set up a steam driven engine and machinery for cutting chaff, used to feed horses. In this photo are (L-R): unknown worker, Charles De Courcy, Charles Florence Wilkinson, Mary Jane Wilkinson, Michael Wilkinson (head visible) and unknown worker. Later on, Charles Florence who was a carpenter and joiner by trade, built three shops on the property and rented two to other businesses. Photo and history supplied courtesy of Dr Peter J Wilkinson (grandson of Charles Florence Wilkinson).